The parsnip (Pastinaca sativa) is a root vegetable related to the carrot. 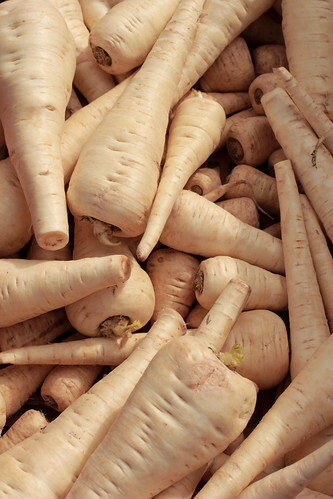 Parsnips resemble carrots, but are paler in colour than most carrots, and have a sweeter taste, especially when cooked. The buttery, slightly spicy, sweet flavor of cooked mature parsnips (often picked after the first frost) is reminiscent of butterscotch, honey, and subtle cardamom. Like carrots, parsnips are native to Eurasia and have been eaten there since ancient times. Zohary and Hopf note that the archeological evidence for the cultivation of the parsnip is "still rather limited", and that Greek and Roman literary sources are a major source about its early use, but warn "there are some difficulties in distinguishing between parsnip and carrot (which, in Roman times, were white or purple) in classical writings since both vegetables seem to have been sometimes called pastinaca yet each vegetable appears to be well under cultivation in Roman times." As pastinache comuni the "common" pastinaca figures in the long list of comestibles enjoyed by the Milanese given by Bonvesin de la Riva in his "Marvels of Milan" (1288).